The decision to revoke the licence from the Bargain Beers & Wine store in Frimley Road was made by the Surrey Heath Borough Council licensing committee after evidence was heard that the store was not complying with a number of conditions of its premises licence and that staff had not been given any training in relation to the Licensing Act 2003. There was also found to be a lack of supervision by the owner, Harpreet Singh, who is also the Designated Premises Supervisor. Mr Singh was also found to be in breach of his licence by not having any staff training records and for not keeping records of any refusals of alcohol. Concerns were raised after police attended the shop on 2 January following reports that a robbery had taken place at the premises and a large amount of cigarettes had been stolen. Whilst speaking to members of staff, it emerged that the CCTV was not working so there was no footage of the incident taking place. Enquiries were carried out in the local area, including checking other premises with CCTV, but there was no trace of the suspects. Officers made contact with the premises licence holder, Harpreet Singh, on 4 January, who had not been told by his staff that a robbery had taken place at the shop. Police met Mr Singh and two other members of staff at the premises on 9 January when it was confirmed that the CCTV had not been working at the time of the robbery, and that this was in breach of the licensing conditions, which state that the system should be in good working order at all times and fully operational when the premises is open to the public. The members of staff who were present confirmed that they had not received any licensing training and Mr Singh was unable to produce any staff training records. He was also unable to produce any records of refusals of the sale of alcohol to underage customers. The two members of staff were very unclear about what to do if a young person tried to buy alcohol. Surrey Heath Licensing Officer Rab Carnie said: “A very serious incident occurred at the premises and due to the incompetence of the management and staff, our enquiries were severely hindered. “A number of other serious breaches of their license also emerged following further investigation. 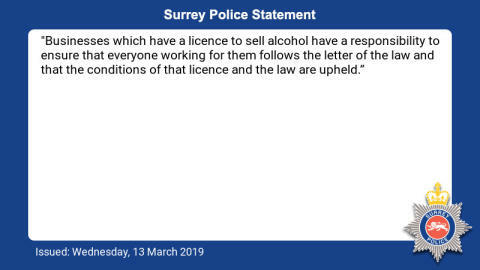 “We work very closely with our licensed premises but when licensing conditions are not being adhered to, we will take action with our colleagues from Surrey Heath Borough Council.